Over the years the Jays have had many first round picks that worked out (Halladay) and many that didn't (Beede). But what if the Jays took the guy who came after their #1 pick - IE: instead of Romero they drafted Troy Tulowitzki. How often did the Jays make the right choice, and how often the wrong one? Posted by John Northey on Saturday, August 20 2011 @ 11:00 PM EDT. A lot of young men are going to be made awfully rich today. The Jays have yet to come to terms with 24 of their 55 June draft picks. Obviously a number of the later round picks will not sign but the Jays have a number of big fish left in the pond. Let's take a look. Posted by braden on Monday, August 15 2011 @ 09:48 AM EDT. Beer Club Friday June 24! Opera Bob's is starting their series of "JAYS DAYS" and I thought it would be a good opportunity for a beer club. Check the details below. Posted by Dave Rutt on Wednesday, June 15 2011 @ 11:22 AM EDT. The June 6-8 amateur draft fallout is already beginning. So far we've heard that about five draft picks have signed with a handful of undrafted free agents also coming to terms - although all moves have yet to be confirmed by the organization. The Vancouver Canadians' season begins on Friday (June 17) so we should be seeing a bunch of player signings (likely lower picks) become official in the coming week. Posted by Marc Hulet on Saturday, June 11 2011 @ 07:28 PM EDT. Meaty, BEEDE, Big & Bouncy! Who did the Toronto Blue Jays use the 21st pick of the 2011 MLB Draft on? 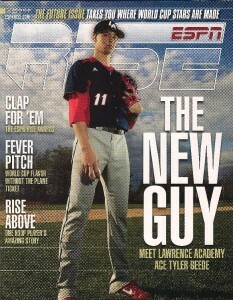 Tyler Beede, a 6-foot-4 righthanded pitcher from Lawrence Academy High School in Massachusetts. Committed to Vanderbilt, the word is the Jays will have to pay big time for Beede to join the nest and not join the Commodores. It won't be easy but the Jays may have a good one here according to ESPNBoston.com. Tyler Beede, the Blue Jays first pick of the 2011 MLB Draft. Update 1: Jays select OF Jacob Anderson, Chino HS, California with the 35th selection. 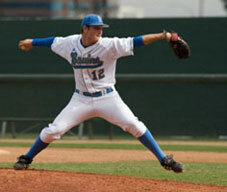 Update 2: Jays select RHP Joe Musgrove, Grossmont HS, California with the 46th selection. Update 3: Jays select OF Dwight Smith Jr., McIntosh HS, Georgia with the 53rd selection. Update 4: Jays select RHP Kevin Comer, Seneca HS, New Jersey with the 57th selection. Posted by #2JBrumfield on Monday, June 06 2011 @ 09:05 PM EDT. Not Going To Stay At The UCLA! Cole Goes #1, Bauer #3, Virginia's Hultzen In Between! As expected, the Pittsburgh Pirates selected RHP Gerrit Cole with the first overall pick in the 2011 MLB amateur draft. Seattle passed on Rice 3B Anthony Rendon and took LHP Danny Hultzen from Virginia with the second pick. Arizona went with RHP Trevor Bauer at number three. Baltimore selected the first high schooler in RHP Dylan Bundy from Owassa, Oklahoma. The first position player was taken by Kansas City, who went with the hometown kid in OF Bubba Starling from Gardner Edgerton High School in Kansas at number five. Rendon slipped to Washington at number six. You can follow the draft on MLB.com live by clicking here. Posted by #2JBrumfield on Monday, June 06 2011 @ 08:16 PM EDT. The draft begins tonight and for the first time it is available on TV in Canada, if you get Sportsnet One. The Jays first pick is a mystery still and we won't know who the lucky guy is until around 8pm tonight. The Bachelorette is on TV tonight too but that is a different group of guys trying to get lucky. The mock drafts and predictions are coming hot and heavy' let's see if there is any consistency this week. Posted by Gerry on Monday, June 06 2011 @ 12:23 PM EDT. We are down to less than a week before the draft, it starts next Monday evening to be precise. Mock drafts are breaking out all over and prognostications (guesses) are a dime a dozen. Posted by Gerry on Tuesday, May 31 2011 @ 10:28 AM EDT. The 2011 draft is less than two weeks away and, as usual, there is no hint of who the Jays might take. The Jays first pick at number 21, then in the supplemental first round they pick at number 35 (Scott Downs); 46 (John Buck); 53 (Kevin Gregg); and 57 (Miguel Olivo). 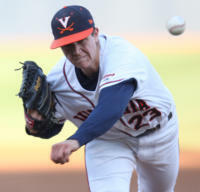 The Jays also pick twice in the second round, with another Scott Downs related pick added to their regular selection. The mock drafts are out in force. Posted by Gerry on Thursday, May 26 2011 @ 10:12 AM EDT. There wasn't overwhelming feedback against my initial suggestion in the other thread, so we'll go with Opera Bob's on Wednesday for the first (of hopefully many!) Batter's Box Beer Clubs of 2011. Let me know if you plan on dropping by! Posted by Dave Rutt on Sunday, April 24 2011 @ 12:29 PM EDT. Tuesday: With apologies to my fellow roster members, I'm bumping this to the top as I feel like it got buried under the deluge of posts from yesterday. If you're interested in having a beer over a game next week during the Rangers series, I'd love your feedback! Will make an announcement soon. Posted by Dave Rutt on Wednesday, April 20 2011 @ 11:50 AM EDT. Today the teams will select players in round 2 through 30. The Jays have two additional picks in the second round and one in the third. Their first few picks of the day come at 61 (2nd round); 69 (Eliopoulos); 80 (Scutaro); 93 (3rd round); and 113 (Barrett). Then it is down to every 30th pick. The timetable is a lot faster on day two, the picks come every thirty seconds or so. There are still some bigger names left on the board and the Jays can still expect that their in depth scouting has found some gems they can steal in this part of the draft. The picking starts at noon. Posted by Gerry on Tuesday, June 08 2010 @ 11:48 AM EDT. Draft day is here. This years first round draft choices appear to be the most uncertain in several years. A few years ago, Jim Callis of Baseball America was able to predict the first thirteen or so picks of the first round. This year the picks, once you get past the top three, are a guessing game. The talent level for picks from 4 to 40 is supposed to be very even, which should help the Jays. This year they have seen the top players ten or more times instead of three times. They should have more information than other teams and so should be able to make more educated selections. The fun begins at 7:00. There will be 50 players drafted tonight. The Jays will select four of them at 11; 34, 38; and 41. We will update this thread with the picks as they happen. UPDATE: Shocker! Washington selects the former artist known as catcher Bryce Harper, outfielder Bryce Harper of the College of Southern Nevada first overall. Washington - Bryce Harper, OF, College of Southern Nevada. Pittsburgh - Jameson Taillon, RHP, Woodlands HS, Texas. Baltimore - Manny Machado, SS, Brito Harper HS, Florida. Kansas City - Christian Colon, SS, Cal State Fullerton. 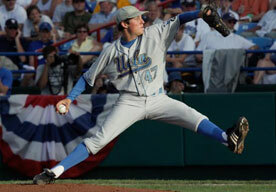 Cleveland - Drew Pomeranz, LHP, Mississippi. Arizona - Barret Loux, RHP, Texas A&M. New York Mets - Matt Harvey, RHP, North Carolina. Houston - Delino DeShields, Jr., OF, Woodward Academy, Georgia. San Diego - Karsten Whitson, RHP, Chipley HS, Florida. Oakland - Michael Choice, OF, Texas-Arlington. Posted by Gerry on Monday, June 07 2010 @ 06:00 PM EDT. The first round of the draft is Monday night. The Jays choice is still a matter of intense speculation. The picks in front of the Jays appear to be up in the air and the Jays don't know who will be left when their first pick comes around. Posted by Gerry on Sunday, June 06 2010 @ 12:54 PM EDT. The draft is eight days away. Use this thread as a catch all for draft discussion. Posted by Gerry on Sunday, May 30 2010 @ 10:43 PM EDT.